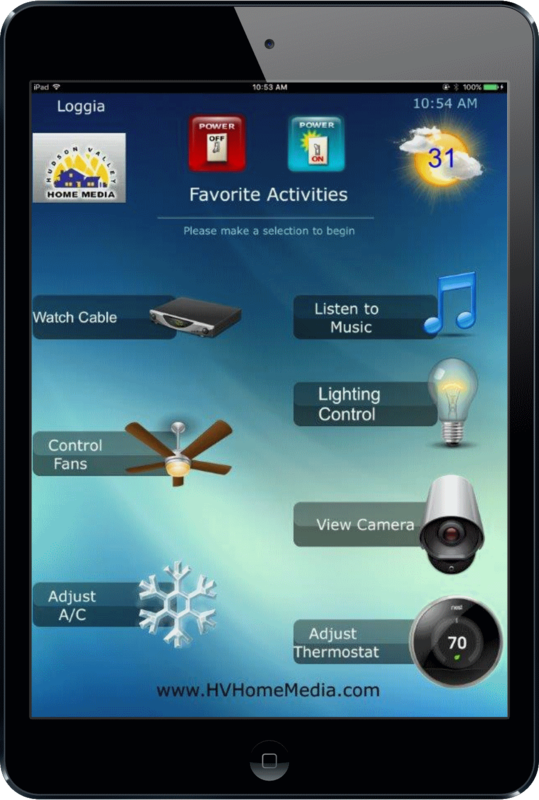 Our home automation systems work on your iPad and make life more enjoyable. Use a touch screen device to turn on the TV, dim the lights, lock the doors before bed, and listen to music throughout your whole house distributed audio system. Did you forget to close your shades? Your motorized blackout blinds will take care of that for you. Impress friends and family members with an automated smart home installed by Hudson Valley Home Media. Complete the form below or contact us at 845-613-0640 for immediate assistance. Our home automation app offers all-in-one universal remote functionality by connecting your home control and entertainment systems. Finally automate and Control Lighting, TV, Security Cameras and more all from a centralized application, accessible from your iPad. Change channels, adjust the volume and access your DVR or Media server from your favorite iPad. We make watching TV and Movies easy. Get a multi room whole house audio systems installed for music in one room or the entire house. Experience multiroom wireless speaker systems today!